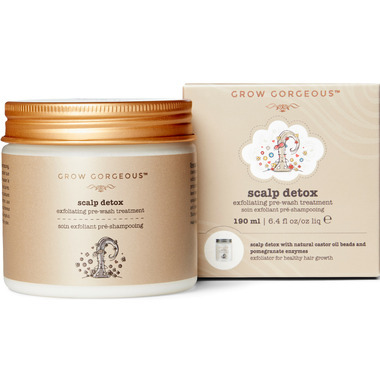 Detox your scalp from impurities that can block roots by using the pomegranate enzymes and natural castor oil beads in Grow Gorgeous' pre-wash Scalp Detox. The treatment works to exfoliate the scalp and shift dry skin to create the perfect environment for hair growth. Natural Castor Oil beads and White Willow Bark Extract exfoliate the scalp to help remove any impurities and act as a natural anti-bacterial to promote hair growth and give a lustrous shine to hair. The unique blend of minerals moisturises the scalp and absorb any excess sebum helping to extend time between washes. Pomegranate fruit enzymes gently remove the outer layer of dead skin cells to naturally exfoliate the scalp and remove product build-up. Bean Bio-ferment absorbs UV light and provides anti-oxidant protection to the hair and scalp. Ingredients: Aqua (Water), Glycerin, Hydrogenated Castor Oil, PEG-6 Caprylic/Capric Glycerides, Lactobacillus/Punica Granatum Fruit Ferment Extract, Carbomer, PEG-40 Hydrogenated Castor Oil, Parfum (Fragrance), Lactobacillus/Dipteryx Odorata Seed Ferment Filtrate, Phenoxyethanol, Sodium Hydroxide, Menthol, Menthyl Lactate, Leuconostoc/Radish Root Ferment Filtrate, Allantoin, Disodium EDTA, Ethylhexylglycerin, Salix Alba (Willow) Bark Extract, Zinc PCA, Niacinamide, Sodium Starch Octenylsuccinate, Calcium Pantothenate, Maltodextrin, Butylphenyl Methylpropional, Limonene, Linalool, Sodium Ascorbyl Phosphate, Pyridoxine HCL, Tocopheryl Acetate, Silica. Nice clean ingredient list. No silicones! Smells great, so clean and fresh. Once you massage it into your scalp it starts to tingly lightly. After rinsing it out and washing, my hair was clean and shiny. I love this detox treatment. It really makes one's scalp breathe. A little goes a long way, just massage into scalp, add a bit of water and wait for the cooling sensation. I have fine long hair and I love the Grow Gorgeous line. This product is too oily for my thin hair. Has great ingredients. I think it will do well for those with a lot of hair. this did nothing for my scalp but the worst part was the smell. it basically smells strongly of...men's cologne or something. it's bad. can't wash out the smell with shampoo and conditioner - it's that strong.